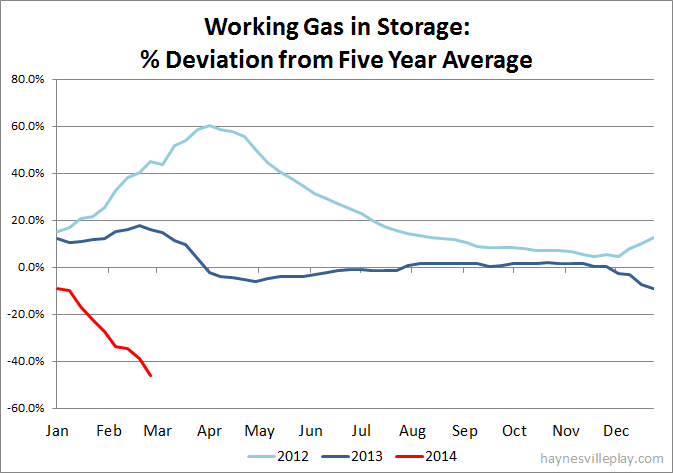 The EIA reported this morning that working gas in storage decreased by 195 Bcf to 1.001 Tcf last week. 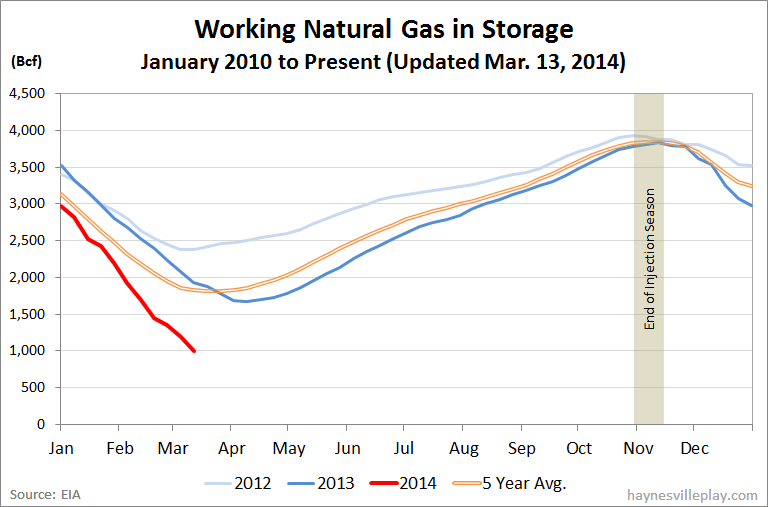 The weekly withdrawal was 34% greater than last year (-145 Bcf) and double the five year average (-95 Bcf). Yawwwnnnn! In any other year, this would be a huge development, but in this year of record withdrawals it seems about right. What's interesting to note is that the withdrawal season last year ended the second week of April, which began the final correction from 2012's massive deviation. If the same trend plays out this year, we are looking at four more weeks of withdrawals, which would probably cause a mild panic. Over the past six years, the average end of withdrawals is March 23, which would imply another couple of weeks of withdrawals. Given the frigid weather across much of the country this week, there should be another big one next week. Who knows about the following weeks. Should be interesting. Temperatures in the Lower 48 last week averaged a nippy 31.1 degrees, which was 7.1 degrees cooler than last year and 9.9 degrees below the five year average.